Torus Power, a subsidiary of Plitron Manufacturing, has just announced that they are now offering two models within their Torus TOT Series. The TOT Mini 7A and now a new TOT Max 15A model. The TOT Series models have been developed to deliver convenient, point-of-use power conditioning. Along with North American versions, International versions are also available for use in Continental Europe, UK, and Asia/Australia. The TOT is a compact, stand-alone power conditioner with a sloped chasis that allows for convenient placement and/or mounting, including in-wall between 14” studs, using an optional mounting kit. 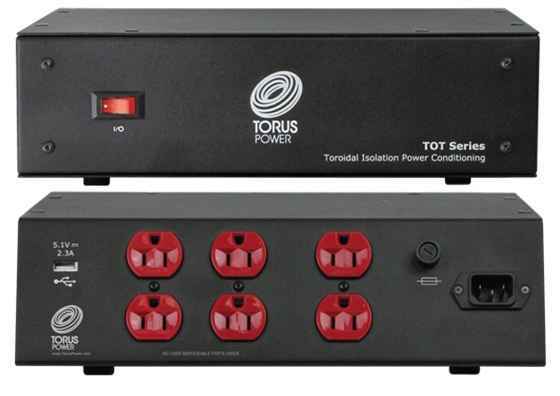 The Torus TOT Series power conditioner is designed to improve the dynamics, imaging and bass of attached audio components, while providing crisper, brighter and darker black images with connected video equipment. The TOT uses Plitron toroidal isolation transformers and triple shielding to maximize noise attenuation and maximize isolation from polluted power lines for higher quality sound and picture, via connected components. The TOT Series employs Plitron’s NBT noise filtering technology to restore incoming power to its clean original state, protecting valuable systems from voltage sags, brownouts and surges. They also provide very low source impedance to connected devices that enables high current delivery – up to the rated current limit – on an instantaneous basis; ensuring dynamic components are never starved for power.